Despite tight competition, Snapchat stands strong as it retains a dedicated following of young people who cannot be found on other social networks. According to the recent data from App Annie, 46% of Snapchat users cannot be reached on Instagram. Using App Annie Intelligence, App Annie analyzed smartphone users data in the US and UK in Q4 2016 to see which social media networks and messaging apps they spend their time on, with a specific interest in audience overlap with Snapchat. 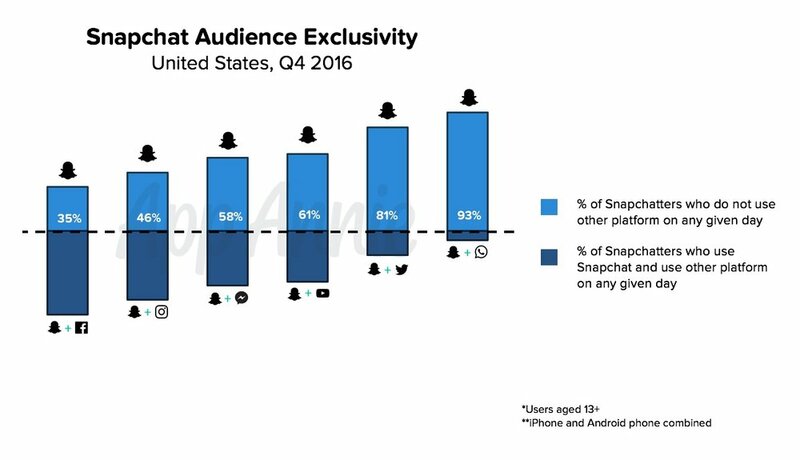 The results demonstrated that Snapchat "has a truly unique and exclusive audience". On an average day, 35% of Snapchat’s daily users in the U.S. cannot be found on Facebook, 46% of users can’t be found on Instagram, and 61% are not watching YouTube videos on that day. Overall, the most overlap happens with Facebook-owned apps including Facebook, Instagram and Messenger. App Annie has also revealed some of the data from its 2017 Global Usage report. According to the report, people spent 1 trillion hours in apps in 2016, with global users average two to three hours per day in apps. An average consumer uses more than 30 apps per month and around 10 apps on a daily basis. Most popular apps belong to utilities and tools category, followed by social networking and communication apps.